Merry Christmas guys! Or that’s the message we think Starmobile is trying to say with its hot announcement today about the new the Diamond X1. 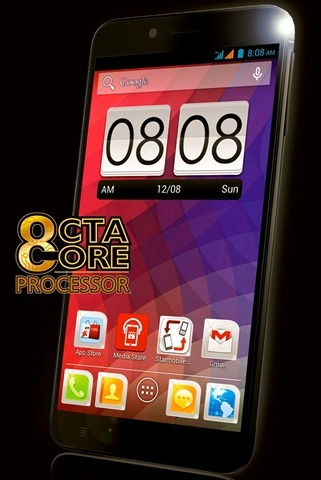 E-mail came in from their marketing department just minutes ago teasing the first Octa-Core device to be offered by a local brand. We don’t have a list of specs yet, but the aforementioned Diamond X1 as the name suggests will be a 6.0” phablet with quote, “the same Starmobile build quality, optics, and imaging features.” That probably means we should expect some high quality cameras and the great design the company is known for. Not much else we can say about it at this point except they gave a January 2014 date. And if so, are you now holding on to your 13th month pay? Starmobile Diamond X1 – PHP ?????? While technically Samsung makes Exynos processors that can be configured as Octa-Core, we doubt that will be the processor used on the Diamond X1. Most likely it will be the Octa-Core MediaTek 6592 released late this year – which means we can expect a clock speed of 1.7-2.0Ghz, hardware support up to 13MP cameras, 1080p video encoding and decoding, ARM Mali 450 graphics, and displays up to 1080p. That said, we may just be off target entirely. We’ll just have to wait for more info and have another glass of eggnog. Merry Christmas guys! This model is now available for online purchase. my problem with the THL is availability and service centers to help fix it. They’re pricey.